To the surprise of many, it's President Trump. In the days ahead of the election, global equities sold off when Donald Trump narrowed Hillary Clinton's lead in the polls after the FBI reopened the investigation into Hillary's emails. After the FBI announced that there were no grounds to prosecute on the Sunday before the election, global equities rallied as pollsters raised their odds of a Clinton victory. On election night, when it became evident that Trump might win the election, Asian equity markets fell and Dow futures plunged almost 800 points. After his conciliatory acceptance speech, equity futures recovered and, after opening lower on Wednesday morning, the US equity market began a strong three day rally that was not expected. This post looks at the early reaction of global markets to the Trump victory through the lens of the global ETFs that we normally track. 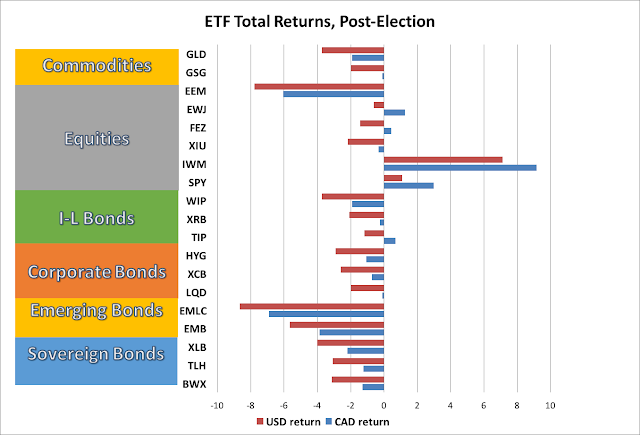 The chart below shows the returns on global ETFs, from the close on election day, November 8 (before results were known), until the close on Friday, November 11. The returns are shown both in USD terms and in CAD terms, which are of interest to Canadian investors. 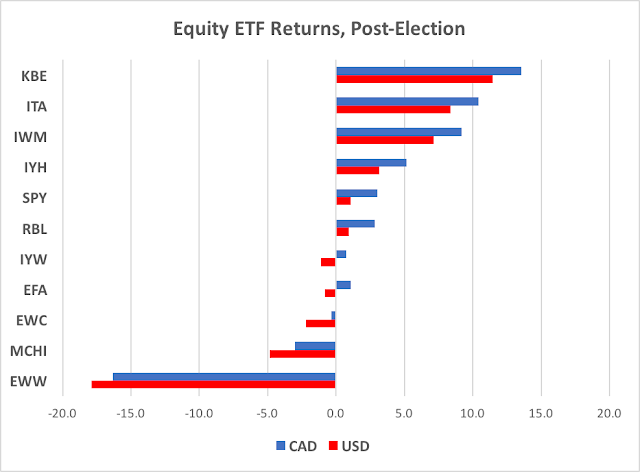 The USD gained 1.9% versus CAD from the close on November 8 to the close on November 11, thereby pushing up CAD returns on USD-denominated ETFs. In USD terms, US equities were the only ETFs that posted gains after the Trump win. The biggest gainer among the ETFs we track in this blog was the US small-cap equity ETF (IWM) which gained 7.1% in USD terms and 9.2% in CAD terms. The US large-cap equity ETF (SPY) gained 1.0% in USD terms and 3.0% in CAD. Other global equity ETFs didn't fare as well. The emerging market equity ETF (EEM) posted a large loss, with Canadian (XIU), Eurozone (FEZ) and Japanese (EWJ) equities posting more modest losses in USD terms. The biggest losers were emerging market ETFs, led by the emerging market local currency bond ETF (EMLC) -8.7% in USD terms, the emerging market equity ETF (EEM) -7.8%, and the emerging market US dollar bond ETF (EMB) -5.7%. All other asset class ETFs posted losses. In commodities, the gold ETF (GLD) was down 3.7% in USD terms, while the commodity ETF (GSG) was down 2.0%, as oil price declines outweighed gains in copper and other metals. In sovereign bonds, Canadian (XLB), US (TLH) and non-US (BWX) bond ETFs all lost 3-4% in USD terms. US (TIP) and Canadian (XRB) inflation-linked bonds outperformed their sovereign counterparts, but not by much, and the non-US inflation linked bond ETF (WIP) underperformed its sovereign counterpart. Corporate bond ETFs also posted losses, as US investment grade (LQD), US high yield (HYG) and Canadian investment grade (XCB) all posted losses of 2-3% in US terms. While US equities performed best, it is interesting to look at little deeper into equity returns as shown in the chart below, which looks at some other equity sector and country ETFs. The chart shows that when looked at by sector and by country, there were some much bigger winners and losers. The US bank stock ETF (KBE) gained 11.5% in USD and 13.6% in CAD. The US defence and aerospace (ITA) and health care (IYH) ETFs also both outperformed the S&P500 by a wide margin, while the technology ETF (IYW) posted a loss of 1.1% in USD. As for country or regional equity ETFs, the Mexico (EWW) and China (MCHI) equity ETFs were big losers, down 17.9% and 4.8% respectively in USD terms. Interestingly, the Russia ETF was one of the few gainers. The EAFE (EFA) and Canada (EWC) equity ETFs were more modest losers. The anticipated positive effects on US small business profitability of repealing Obamacare, reduced red tape, lower taxes, and reduced competition from Mexico and China triggered the outsized gains in US small-cap equites (IWM). US large-cap equities also gained, but significantly underperformed small-caps, as large global companies face a more mixed picture as they depend more on global trade and supply chains than do small-caps. The anticipated fiscal stimulus reflected in plans for lower taxes and increased infrastructure and defence spending is likely to boost both growth and fiscal deficits in the short term. The market reacted by lifting defence and construction equipment stocks and by selling off US Treasury bonds. With fiscal policy taking the lead in boosting growth, US monetary policy will likely move more quickly to normalize the policy rate and be less likely in the future to resort to unconventional policy measures, including quantitative easing and negative policy rates. As a result, markets are signalling an expectation that bond yields will continue to rise from record lows. Tightening immigration and deporting illegal immigrants is likely to reduce labor supply in an already tight US labor market, thereby adding to wage pressures. Raising tariffs and rejecting or weakening free trade agreements will put further upward pressure on inflation, more bad news for bond ETFs. Anticipation of rising interest rates, a steepening yield curve, and talk of repeal of (some of) the Dodd-Frank bank regulations imposed following the financial crisis, provided a huge boost to US bank ETFs. Trump's plans to raise tariffs and reject or renegotiate trade deals, is clearly bad news for countries dependent on trade with the United States, including Mexico, Canada and China. It is also bad news for US industries which have developed major supply chains in these countries, including the US technology and auto industries. The intention to reject the Paris Agreement on climate change will free US energy producers from concerns about possible emissions targets or carbon taxes and encourage greater US oil and coal production. It will also likely lead to reduced subsidies and other incentives for technology companies pursuing green energy projects. Global asset markets have adjusted swiftly to a changed set of expectations is the wake of the election of Donald Trump. Details of his policies remain unknown, but the market clearly senses, and already reflects, the broad strokes of President-elect Trump's policy priorities. What remains to be seen, is how quickly and how fully his campaign promises will be implemented.